We are your Asphalt Paving Contractor servicing Arlington, Texas, and the entire State of Texas. We have been providing asphalt paving services to the Dallas / Fort Worth area for over 45 years and we look forward to serving your commercial or residential project too. There is no asphalt paving job too small or too large for our crews. We are ready to tackle every type of asphalt construction project imaginable. 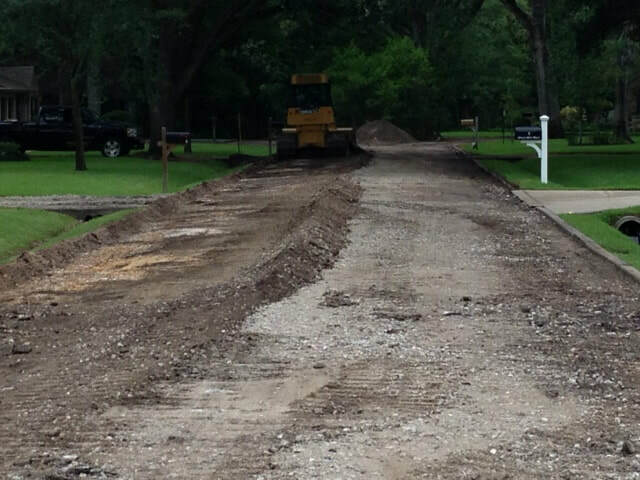 Previous projects include driveways, roads, parking lots, walking paths, golf cart paths, airport runways and more. Not only do we do new constructions, but we also do all types of asphalt maintenance including patch jobs as well as full resurfacing. We are fully committed to not only providing you with excellent paving service, but we also provide the best customer service in the industry, and we look forward to keeping you as a lifelong satisfied client. ​We would love the opportunity to bid on your project. We always provide a FREE no-obligation written estimate. Contact us today and we will schedule a time to come meet with you to discuss your project and provide with the estimate of work. We specialize in all areas of Asphalt Paving, Asphalt Milling, Asphalt Repair, Asphalt Resurfacing, Tar and Chip, Sealcoating, Line Striping, Pavement Maintenance, and repair. We do paving for commercial and residential clients and have worked with homeowners, property managers, business developers, government agency, retail shopping centers, Home Owners Associations, or any other type of business, our professional services team will be able to assist you with every paving project large or small. Over time asphalt will deteriorate. Regular maintenance will help prolong the life of the asphalt surface. If your asphalt has not been maintained properly, and you find you are in need of repair, but you are not fully ready to actually replace the existing asphalt, we can do an asphalt overlay for you. This is where a new layer of asphalt is laid right on top of your existing asphalt surface. This asphalt overlay will provide an extended life of the pavement as a fresh layer is placed on top. This will bring on great curb appeal and will look very good. Call us today to speak with one of our professionals to find out if doing an asphalt overlay is something that can benefit you, and help keep money in your pocket a little longer regarding your asphalt replacement or repair. We will come out, and evaluate the integrity of your current surface to determine if this procedure will be a viable option for you or not. 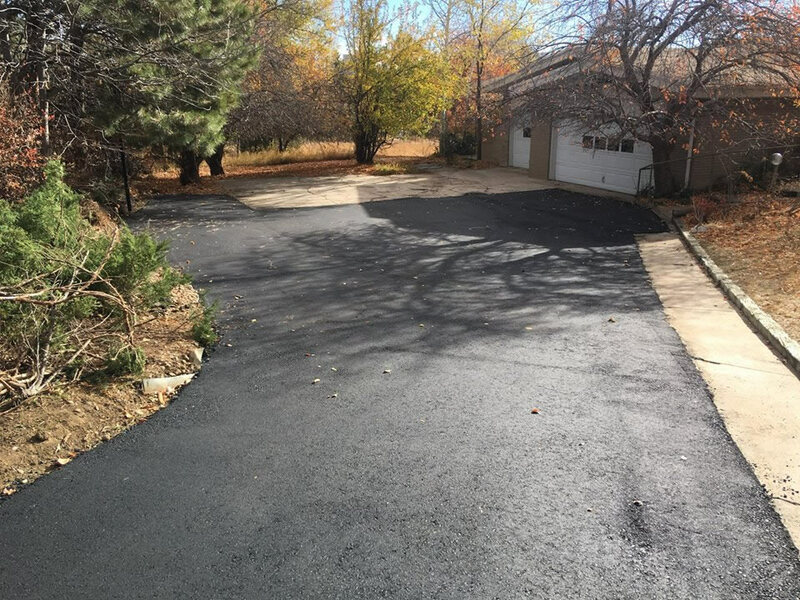 Tar and Chip is a very economical paving solution for your driveway, roadway, or parking lot, and is much less expensive than concrete, or hot mix asphalt. The chip and seal paving method as it is sometimes called have been used for hundreds of years, and the reason is that it is very durable. Many people love this paving method because they can choose the types of gravel to use for the project. This also means you are choosing the color of gravel, and in doing so the gravel can easily be matched with your current landscape or surrounding buildings. Chip seal paving is very versatile, long lasting, and will make your property look beautiful too. The tar and chip asphalt paving method combines the hot tar paving material, along with gravel and it is mixed right on the job site as it is being laid, unlike asphalt that is premixed at a factory. As the hot tar is applied to the base surface, gravel is then spread on top of the hot tar. A heavy-duty roller is then rolled on top of the gravel to press it into the tar. There will be some loose gravel left on the top, but this is typical and part of the chip seal paving. If applied properly, a chip and seal paved surface will typically last 10-15 years but can vary based on the amount of traffic, and the type of weather the surface will be facing. Unlike asphalt, tar and chip do not need to be seal coated, and in most cases, chip and seal is approximately 50% cheaper than asphalt. ​Tar and chip is often referred to by many different names, but they all mean the same thing and no matter what name you call it by, it is a great paving surface. If you need a brand new asphalt driveway or help with repaving your current driveway, or if you simply need driveway repair, our professional crews are ready to get the job done. As with any paving job, you want to make sure you have chosen a reputable paving contracting company that you can trust to install your driveway correctly. That is where we come into the picture. When you hire us to do the job you can rest assured knowing we have installed many blacktop driveways over the years, and we are professionals. 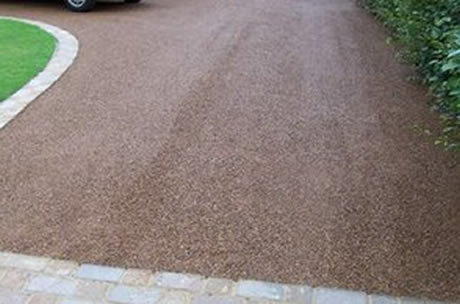 We are great with new driveway layouts especially for farm and country homes, so if you need driveway ideas we can help you with a great and functional design. We want you to be informed about the entire paving process, and we will walk you through the paving steps and show you exactly what we will be doing to install your driveway successfully. We know that investing in your property is a big commitment, and we want you to fully see the value of how your investment in a new driveway, or even repaving your existing driveway will increase the value of your property. ​Asphalt is a great pavement material and will last a very long time if maintained properly. As with any type of structure, proper maintenance is needed to protect your investment as well as maintain the life expectancy of the structure. When you keep up with the normal periodic maintenance, your paved surface will stay safe for pedestrians, it will be easier to clean, it will look nice, and also it will increase the longevity and integrity of the surface. ​Once you have experienced the results of improper maintenance of your paved surface, and know how costly it can be to fully replace the entire surface, then you will understand the importance of continued maintenance. It is a painful lesson that you never want to have to experience more than once. We are experts when it comes to asphalt maintenance, and we can easily evaluate your current asphalt surface, and suggest an appropriate maintenance plan. Sealcoating is a maintenance step that must be done to help prolong the life of the asphalt surface. It is a process of adding a topcoat layer of protection to your asphalt surface. Think of how you maintain your wooden fence. With a fence, you periodically add a layer of stain and sealer to the fence to help prolong the life of the fence and to also keep it looking nice for a long time. Adding a seal coat to your asphalt surface works basically the same way. When a sealcoat is applied to your blacktop asphalt surface, it is adding a layer of protection. This layer of protection will become the new wearable surface, and also weatherproof the surface to prevent water penetration. It also protects against gas and oil spills that will damage the asphalt over time. It also makes the asphalt slip-resistant for an added safety feature for pedestrians. The most important aspect that sealcoating does is that the seal coat actually becomes the main wearable surface. For instance when a car drives onto the driveway or parking lot area, and the wheels turn in any direction this will create what is called abrasion. Abrasion is the wearing down of the paved asphalt surface. Without a sealcoat, abrasion is happening directly on the asphalt itself, which over time will really wear down the main asphalt layer. With a seal coat, the abrasion is occurring to the actual sealcoat layer, leaving the asphalt below untouched. As you can see this extra added protection layer will greatly increase the life of your asphalt pavement surface. With all of that said, it is recommended that you not add a sealcoat to new asphalt installation for at least one year. The asphalt needs time to cure and harden before sealcoat is added. 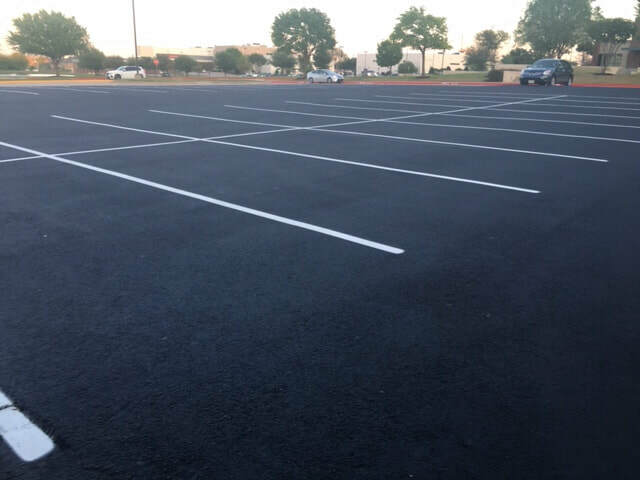 After one year from installation, you should add a sealcoat layer, and then continue sealcoating the surface every 2-3 years, depending on traffic and weather conditions. If you stay on a regularly scheduled maintenance program, you can more than double the life expectancy of your asphalt surface. If your asphalt surface has been neglected, and if you have not provided proper maintenance to the asphalt for many years then sealcoating may not be the answer for you at that point. We can come out and evaluate your current asphalt surface to let you know if seal coating will give you a few more years of life or if it is past the level of repair. We say this just so you know how important sealcoating actually is to maintaining the longevity and lifespan of your investment. It is much less expensive to maintain and sealcoat your blacktop rather than having to pay for a replacement. 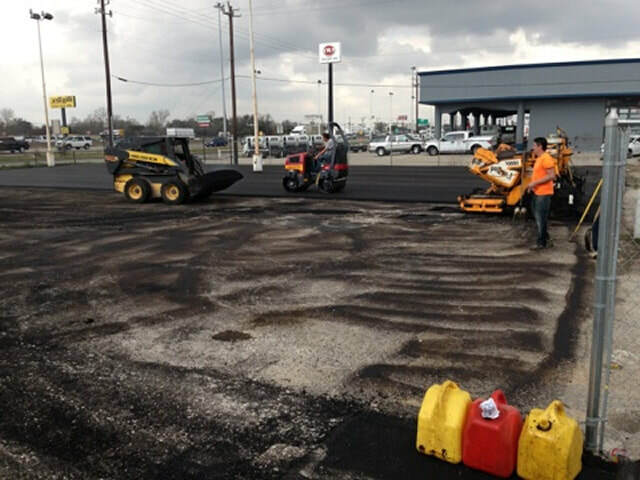 We provide asphalt paving services to Arlington, TX and all surrounding areas in the Dallas / Fort Worth Metroplex. We also provide services to the entire state of Texas, so no matter where you are located, be sure to contact us today for all of your pavement needs.